The President of the Senate, Bukola Saraki, has felicitated with Nigerians on the Eid-el-Kabir celebrations. Mr Saraki, in a statement signed by his Special Adviser on Media and Publicity, Yusuph Olaniyonu, Monday, also charged pilgrims performing this year's hajj to use the significance of the Arafat Day to pray for unity in the country. "Today our country is passing through a difficult phase of nation-building occasioned by economic challenges, rising insecurity and threats to our corporate existence as a nation by the uncertain political atmosphere by actions of selfish politicians," Mr Saraki said. A former Vice President, Atiku Abubakar, has also advised Muslims across the country to promote and spread love among fellow Nigerians in order to consolidate the nation's unity. Mr Abubakar, in a message to mark the Eid-el-Kabir celebration issued by his media office on Monday in Abuja, said religion should be used as a means to advance love among the people. He explained that diversity was not the cause of Nigeria's problems but the attitude of citizens toward one another. "The common interests that unite Nigerians are by far stronger than those petty factors that divide us," Mr Abubakar said, adding that diversity could be used to advantage. He said that intolerance, extremism and bigotry, if unchecked, could threaten peace and unity in any country while peace and unity are the greatest assets that should not be taken for granted by Nigerians. In his message the Ogun State Governor, Ibikunle Amosun, also congratulated Nigerians. "During this festival of the feast, we should ensure that we truly imbibe the virtues of Prophet Ibrahim, who, in obedience to God's directive, sacrificed his only son. "Beyond the sacrifice, we should also not relent in praying for peace, unity and religious tolerance, which are essential to sustaining the glory of our dear nation," the governor said. The Plateau State Governor, Simon Lalong, in his goodwill message, said Muslims should practice the virtue of Islam as professed by Prophet Mohammad (SAW). In a statement, Mr Lalong however enjoined all the Muslims faithful in Nigeria to sustain their prayers for peace, unity and stability. "I wish the Muslim Ummah a happy Eid-El Kabir celebration and assure citizens that all that is necessary to guarantee a peaceful celebration has been put in place for a hitch-free celebration. I all urge you all to be law-abiding during and after the celebration," Mr Lalong said. The Kwara State Governor, Abdulfatah Ahmed, also congratulated Muslims. Mr Ahmed in a statement urged Muslims to imbibe the lessons of total submission and obedience to the will of Almighty Allah. Meanwhile, the All Progressives Congress, APC, in a statement signed by the National Publicity Secretary, Yekini Nabena, urged Nigerians to imbibe the lessons of love, sacrifice and peaceful coexistence. "The All Progressives Congress (APC) felicitates with Muslim faithful and indeed all Nigerians on the joyous celebration of Eid-El-Kabir, the holy Islamic festival to commemorate the obedience and willingness of Ibrahim to follow Almighty Allah's (SWT) command to sacrifice his son," the party said. Similarly, the Peoples Democratic Party (PDP) urged Nigerians to use the occasion of year's Eid el-Kabir to support one another in the spirit of love, unity, sacrifice and dedication to the Almighty Allah. In a statement signed by its National Publicity Secretary, Kola Ologbondiyan Monday, it said Nigerians should join hands to pray for the development of the country. "The PDP holds that Nigerians, across board, deserve to be happy and adequately provided for, with the suitable environment to aspire and thrive in all sectors of life; the main reason all citizens must join hands to pray that the nation gets the right leadership," Mr Ologbondiyan said. "The party also called on the citizens to remember and assist the hurting, particularly, the sick, aged and victims of unfortunate violent attacks and natural disasters that have ravaged our nation in recent time." 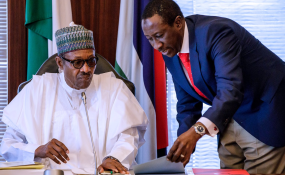 Also, the President of the National Labour Congress, Ayuba Wabba, said Nigerians should not allow selfish individuals who seek power at all costs not for the benefit of all Nigerians but for themselves. "Eid-el- Kabir symbolises sacrifice, discipline, faith, the spirit of give and take, love of God and love for our neighbour, obedience to and total submission to God our creator. "In light of this, we use this opportunity to appeal to all Nigerians, not only Muslims to imbibe the spirit of Eid-el-Kabir," Mr Wabba said. In his message, Governor Ifeanyi Ugwuanyi of Enugu State urged Muslims to continue to uphold and promote the core values of Islam for the sustenance of peace, unity and progress of the country. Mr Ugwuanyi, who felicitated with President Muhammadu Buhari and other Muslim faithful, also wished them the guidance and blessings of Allah, calling on all Nigerians to continue to supplicate for the progress of the country, through good deeds, sacrifice and abiding faith in God. The governor noted that "the ultimate goal remains our collective ability to live in peace and harmony, to cherish one another irrespective of religious, ethnic and political differences, for sustainable development of the nation." He therefore, wished all Nigerians a peaceful and pleasant celebration. The Eid-el-Kabir celebration holds Tuesday and Wednesday, which were earlier declared as public holidays.